Take New England Clam Chowder, for example. It’s a pleasure to sip a bowlful beachside with a few oyster crackers on top. Seems innocent enough, right? It’s soup, after all. Wrong! 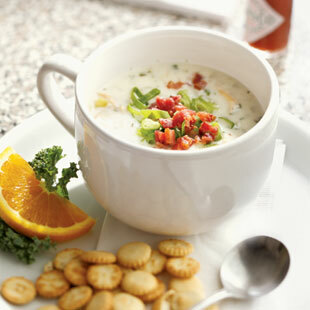 A bowl of clam chowder can have upwards of 450 calories and 20 grams of saturated fat. Yikes! We cut 197 calories and 14 grams saturated fat from the original version (get the recipe here). Our version uses chopped clams, aromatic vegetables and creamy potatoes blended with low-fat milk and just a half cup of cream to give this chunky New England-style clam chowder plenty of rich body. Serve with oyster crackers and a tossed salad to make it a meal. Pulled Pork—Pulled pork is melt-in-your-mouth tender—mostly from fat that oozes out of the meat. We cut 287 calories and 12 grams fat from the original version. The trick to making pulled pork healthy is to trim the meat well and then skim any extra fat off the sauce after cooking. Serve on a soft whole-grain bun with crisp, cool coleslaw. Broccoli Bacon Salad—Traditional broccoli bacon salad is usually loaded with mayonnaise and a generous amount of bacon. We cut 311 calories and 35 grams fat from the original version. A picnic favorite, this salad combines broccoli, water chestnuts, cranberries and just a little bacon for delicious results. Our version has plenty of creaminess without all the fat. Make it once and it will become a regular on your backyard barbecue menu. Key Lime Pie—The rich and creamy texture of Key lime pie usually comes from egg yolks and sweetened condensed milk. We cut 226 calories and 11 grams fat from the original version. In our healthier version we lightened the filling with nonfat condensed milk blended with tangy low-fat plain yogurt and continued the makeover with a topping of lovely golden meringue rather than whipped heavy cream. We tested this healthy Key Lime Pie quite a few times and no one got tired of it. Use Key limes if you can find them, but regular limes work as well.